How is it possible such a little shot can cause so much grief for so many men? A man can make a golf ball travel 400 yards in two shots but give that same man a shot inside 75 yards and you see some tragic things! I'm sure you've also seen countless guys blading balls over the green or hitting fat shots that don't even reach the green. You may be one of them. I know I was. So what's the big deal? There's no carry over water, there's no long carries to hit the fairway...it's just a little shot but it's the shot no one wants to talk about. But it's time we talked about it, so just how do you hit a 30 to 75 yard golf shot? By the end of this guide, I hope you'll be able to do it! By the way, the best way to avoid these shots on the course is to follow my system for breaking 90. A similar concept (with a little drill) is shown at the Golf Channel website here. How do I control the distance from 30 to 75 yards? I like to think of where my back swing must stop and then swing through the ball like a normal shot. You won't generate full shot club head speed with a shortened back swing and that by default will make the shot go a shorter distance EVEN WITH A FULL FOLLOW THROUGH. I like the idea of the clock system in these videos. I use it and have used it for years. I've changed the clock to be a percentage for me. I hit my lob wedge 100 yards in full swing so I stop my back swing at 40%, 75% depending on the distance because 40% is of 100 yards is 40 yards. So the percentages and distance line up perfectly. I use my 53° and my 58° wedge. On full swings, the 53 degree goes 115-120 yards while the 58 degree goes around 100. The 53 degree is good for inside 90 yards where there is a lot of space on the green before the pin. I use the 58 degree for inside 90 yards where the isn't much green to work with. Start practicing with your sand wedge and perfect that. Then move onto your other clubs. It's better to be lethal with one club than average with two or three. Now it's my turn to put these principles in practice! In the video below I took the lessons from this guide and implemented them. I just really sucked at this shot for too long. Now I'm hitting them within putting range and making more saves than ever. Some things were not perfect such as ball position and sternum over the ball, but since then I have started doing that and in just this one session I got 80% to where I wanna be. I love this Mizuno 58° wedge I used for the video. The Footjoy WeatherSof is perfect for hot humid days like the one out there on the range in Malaysia and really keeps it's grip. 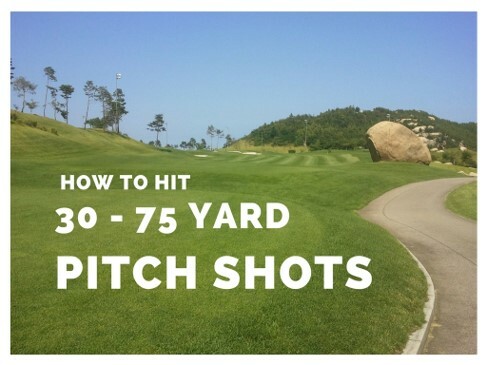 Step 1: Go to a practice facility or your local course where there is a green made for pitching. If you don't have that, get to a grass driving range. Worst case scenario is an artificial turn driving range but it will do. Pick one club you'd like to work on. 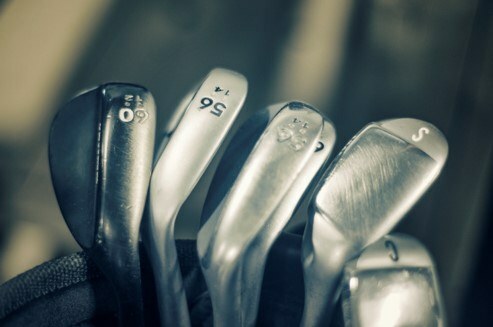 Don't try it with all 3 wedges you own - you'll just confuse yourself. Step 2: Pace out the distance to the hole 30 yards, 50 yards, 70 yards. Some places will have distance markers for you. Step 3: Put a head cover under your left armpit and keep it there throughout your swing to keep your armpits tucked in and get your body turning. We don't want to use just our arms here. Step 4: Hit balls from each distance and consciously take note of where your back swing is ending on each distance. Pro-actively put that feeling into your brain so you can remember it on the course. It's vital to be mindful when practicing otherwise you get onto the course and forget what you taught yourself. Don't worry too much about flight control and super spin on these pitch shots just yet. Worry most about distance control and shot setup. Once you have those fundamentals, you can play around with making the ball spin or hitting lower shots into the greens. So how to hit a 30 to 75 yard pitch shot? Follow the fundamentals in the videos above and then practice it until you feel it in your bones. Always be conscious of yourself when practicing and be mindful of what you're doing and how it feels so you can replicate it on the course. I know it sounds stupid, but when you hit a good one, physically take the "fairy dust" after the shot and put it in your golf bag or your pocket while on the range or practice facility. It genuinely works!